DrupalCampNYC is a community-managed event that relies upon volunteer organizers and sponsorship funding. Camps provide an opportunity for attendee education, topical explorations, and community development; this results in both a stronger pool of Drupal talent and a stronger, more innovative Drupal platform. Sponsorships are critical to the success of these events; without our sponsors, costs would be prohibitive to much of the community and we could not provide a quality experience. Because of this support, we are able to offer content-rich events in well-equipped venues, on a scale that allows for inclusiveness across professional roles and skill levels. We are always in awe of the generosity demonstrated by the companies and institutions supporting our local events! 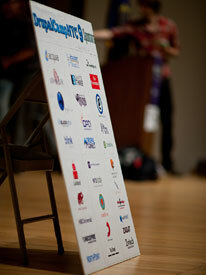 We hope that you will take a moment to get to know the sponsors for DrupalCampNYC 10. If you represent an organization, please consider sponsoring this event and contributing to the quality of NYC's Drupal community.